← Digital Humanities: Reflections on distant reading and why the ability to fly hasn’t stopped us walking. Today (well, then), we looked at modularity and how we could break networks into separate communities. This is important because it helps us to be able to see structure. The human eye is a great tool but it often needs help and modularity is a good way to do this. We have strong ties between components in directed networks (unidirectional) because we have taken the time to say that the link goes this way. We have weak ties in undirected networks because there is no solidity to the association form one side to the other. The more connected something is, the more strongly tied it is to the things it connects to so, when we hunt for communities, we want to take away the least number of connections to produce the largest number of connected communities. 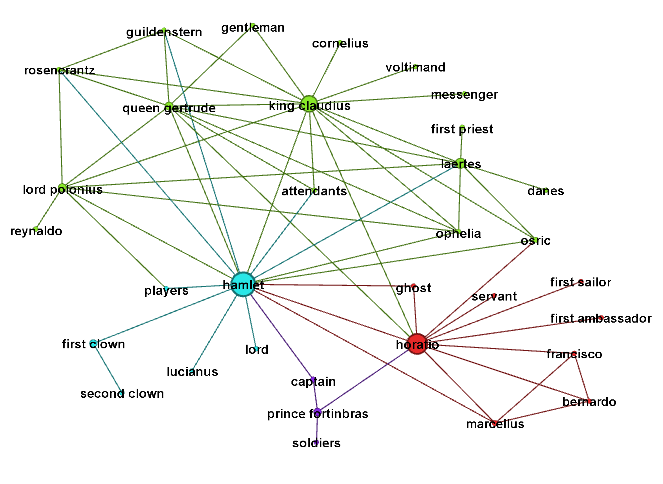 Let’s look at the Hamlet graph (after Moretti) with some colouring added for the various communities and all the connections left in. It’s hard to see any separation here although the communities can be seen. Now let’s take out the intra-community links. Now we can suddenly see, in terms of dialogue exchanges and interaction, how isolated Hamlet actually is. The members of the court are one community. The invaders are another. Horatio, the proxy for the Danish state, is deeply involved in statehood. 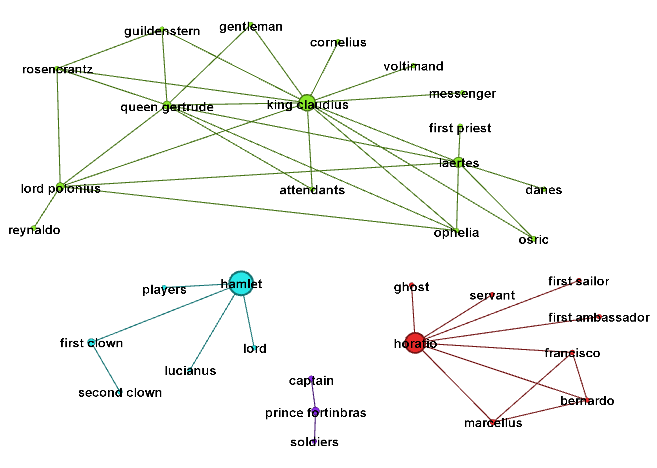 Hamlet, however, is more heavily connected to the characters who help with his dawning realisation that something has gone awry. No wonder he goes mad, he’s the Nigel Nofriends of Medieval Denmark, with only the insane Clown Posse and a group of second-rate actors to keep him company. 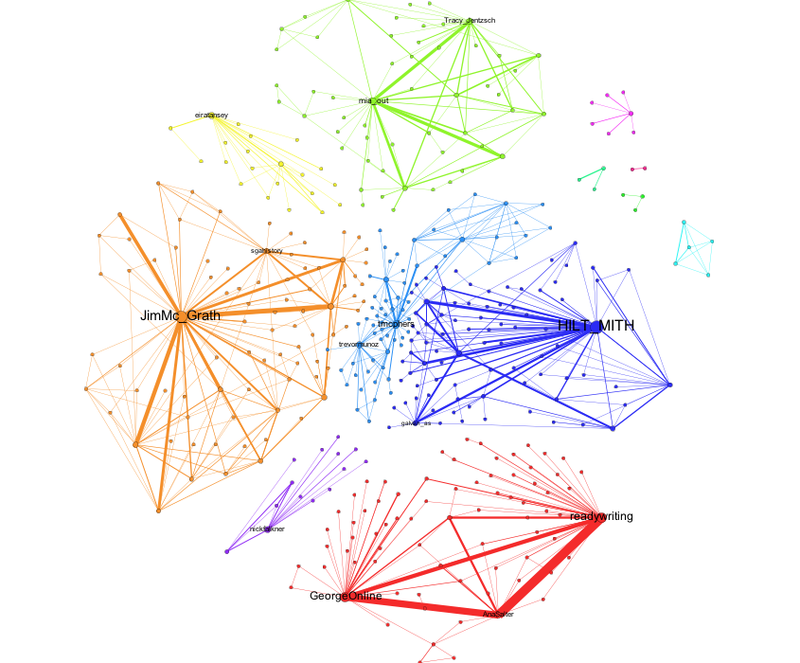 This shows the separate groups of Twitter user communities who used the HILT2014 hashtag. My small cluster is the small purple arrow bottomish left. We’ve also ranked the size of the data labels based on the significance of that person in the Twitter information chain, using the PageRank algorithm. So, Jim McGrath wins Twitter for HILT 2014! We also look and how important certain links were in the network by looking at edge betweenness to determine which links are used by the most shortest paths and then use this to identify important connected components. Lots of good hands-on stuff and a very interesting course! I learned a great deal and have already started using it elsewhere.